The present paper focuses on directional solidification processes for photovoltaic silicon purification. The use of a mechanical stirrer in the melt to enhance impurity segregation is investigated through numerical simulations. The 3D forced convection flow is resolved in a transient regime thanks to a sliding mesh approach. The hydrodynamic model is coupled to a solute transport simulation in a quasi-steady approximation (i.e. with constant liquid height). Velocity measurements are performed by Particle Image Velocimetry on a water model in order to validate hydrodynamic simulations. Numerical results show that an efficient segregation can be achieved, even for high solidification rates, thanks to mechanical stirring. The numerical model provides meaningful insights for process optimization as it correlates the impurity repartition on the solidification front to the stirring parameters. Finally, the numerical segregation results are compared to an analytical model of the solute boundary layer. 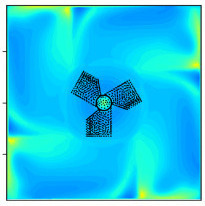 It is found that the analytical model provides a good estimate of the mean segregation regime from an hydrodynamic simulation of the forced convection flow, which makes it a useful tool for process design.